Min Min lights are an unsolved mystery. There are stories of them since the times when only Indigenous People lived in Australia, but even today, nobody really knows what they are. According to the stories, they are like balls of light that hover above the ground, sometimes come near to and follow people, sometimes go out and reappear elsewhere, and generally over the time have scared a lot of people. 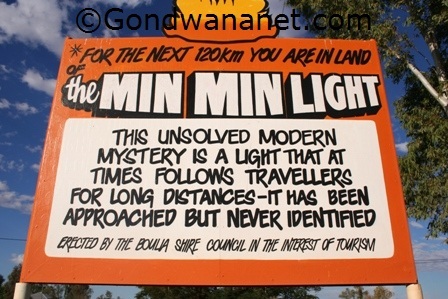 They appear, more so during the summer months, in the western Queensland and New South Wales, but one of the towns that has claimed the fame and turned the phenomenon into tourist dollars is Boulia in outback Queensland. There you have a whole information centre built to the lights. So what is it? Nobody really knows. It is believed that it is an optical illusion, like mirage, but still, what causes it? There are different hypothesis that suggest it could be caused by swarming bioluminescent insects, some geophysical phenomena, and even an optical illusion that comes from other light sources such as car lights, however all the hypothesis have big enough weaknesses that none has succeeded to be established as the answer.